I know I've said this before, but, if you're a piece of fabric in my sewing room and you hang around too long you're bound to get embroidered. I am and always will be in love with fabrics but more and more embroidery seems to be taking up residence in the creative side of my brain. Fabrics can now be canvases since "Aubrey", my embroidery machine, moved in (yes...I named my machine…don't judge). This blouse inspired my "Aubrey and Me" Top. 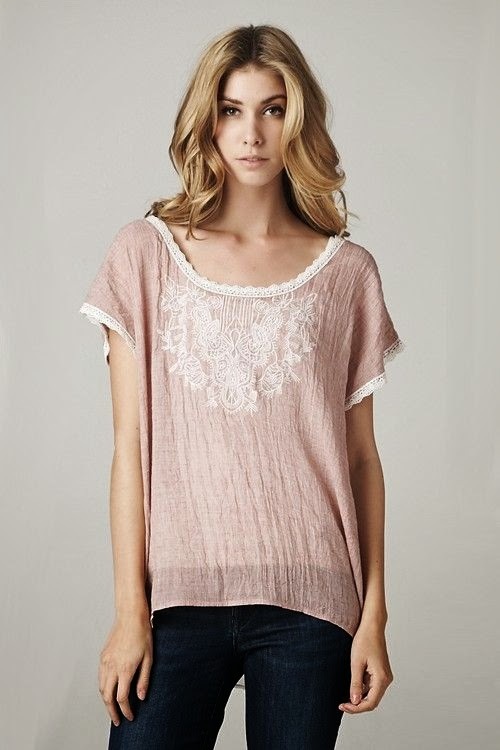 The combination of the embroidery, lace and silhouette makes a top that's feminine without being fussy. 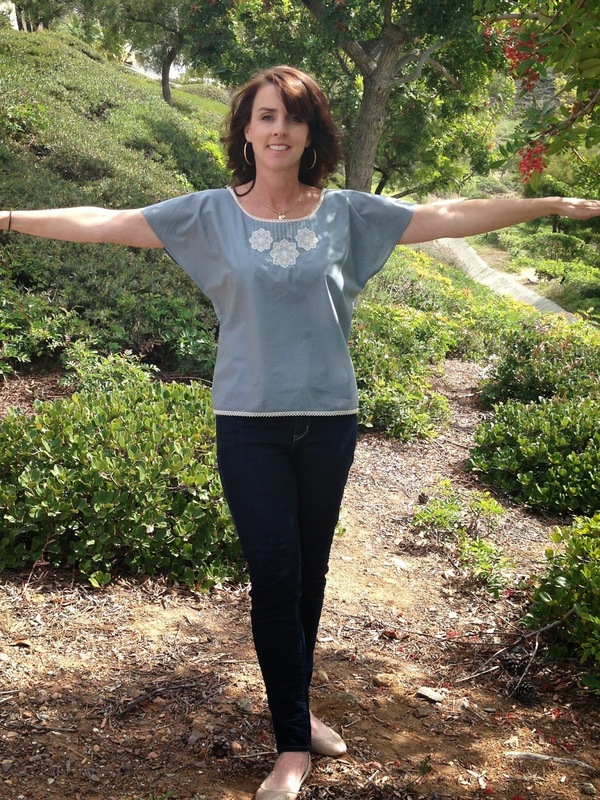 Because a simple pattern lends itself to embroidery, I chose Salme's Kimono Style Angel Sleeve Top for my blouse. It's a two-piece pattern plus facings (it doesn't get simpler than that) with a soft flutter sleeve. I lowered the neckline 3/4" because it's more flattering on me and left everything else the same. I chose this dreamy blue/gray J. Crew voile from Fabric Mart (the color is out of stock but this color would be lovely!) 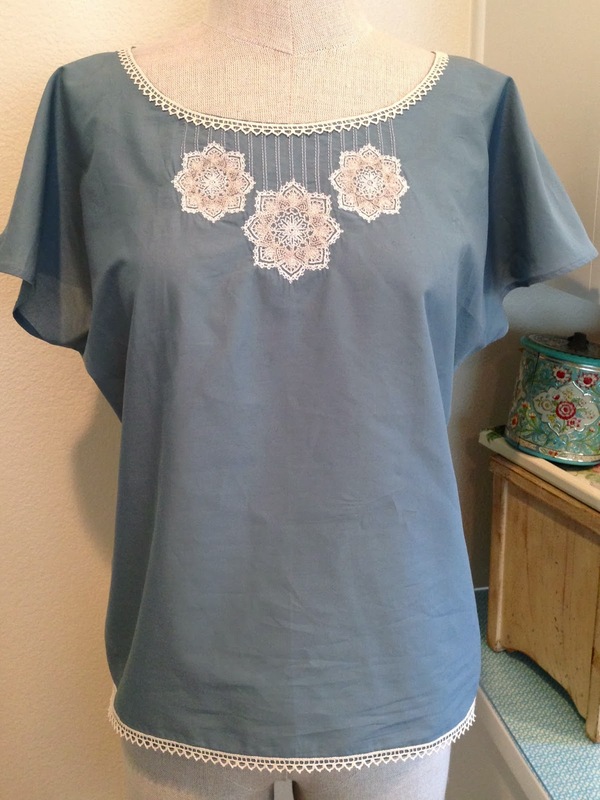 and a cotton crochet trim for the neckline and hem. 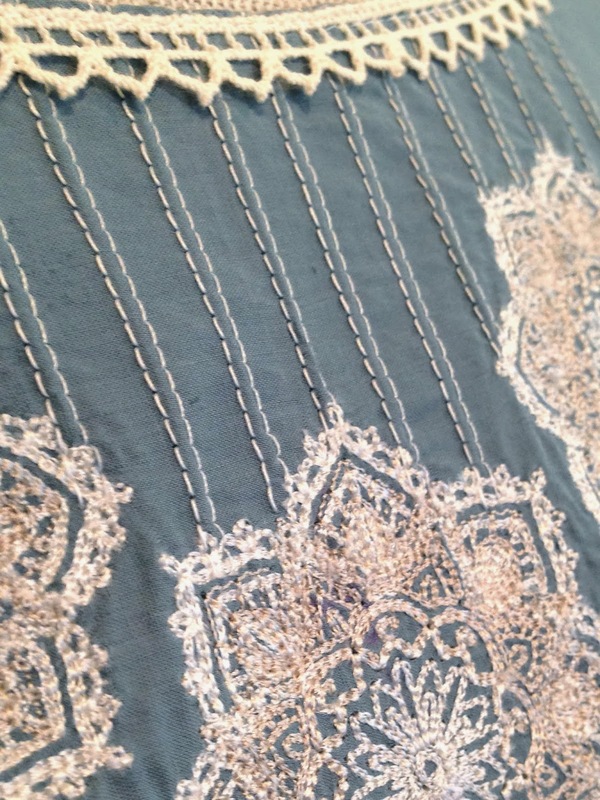 The Mendhika Medallion machine embroidery pattern from Urban Threads is stitched three times at the neckline. The middle medallion is sized to 3" in diameter and the two outer are 2 1/2" in diameter. The medallion comes as a three color design but I changed it to two colors, dark ecru and ecru, and stitched it out in 40 weight rayon embroidery thread. In constructing this blouse, and for almost all of my embroidery projects, I have "Aubrey" do the embroidery before I actually cut out the pattern piece. This makes hooping and placement easier. This voile is very lightweight so after a couple of test runs I found wash away stabilizer the best choice for stabilization during embroidery. My final step before actually sewing the blouse together was adding 17 rows of twin needle stitching in ecru thread. I know 17 rows sounds like a lot but none are more that 2" long and the result is a design that looks pulled together. 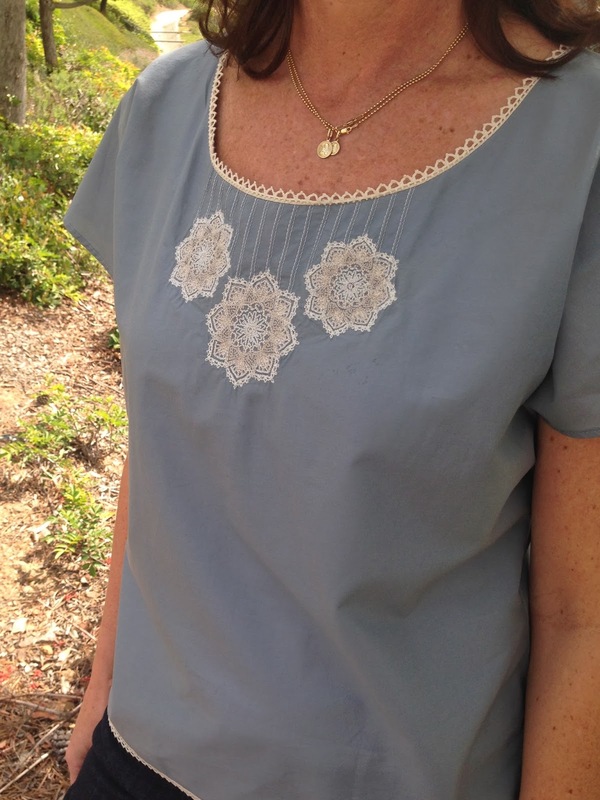 Thank you Diane for a great post and for incorporating some embroidery into your project. 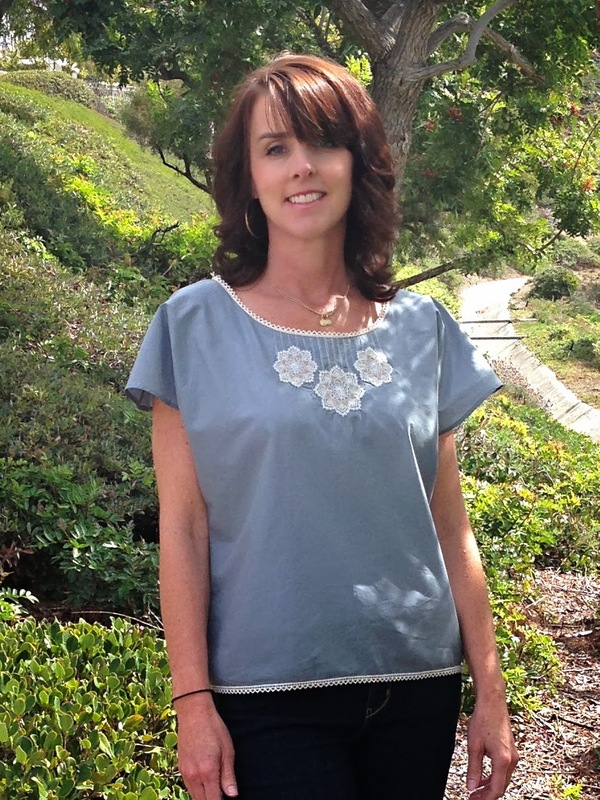 Check out Diane's blog: Gatorbunny Sews. If you would like to be a guest blogger, email fabricmartblog@gmail.com. I have been fortunate to have a sewing room all to myself for a long time. When I lived at home, the former playroom turned into my sewing room. When I got married 2 1/2 years ago, there was an extra bedroom for me to have a sewing room. (And my husband also got his man cave!) My husband and I got married in August 13, 2011. Months before that, we prepared my late-grandmother's house for our move-in. Every single room in the house had wood paneling (which I hated) and needed to be covered up with paint. We sanded, primed (2x) and painted (2x) with a vibrant aqua blue color. (By this time we had done this to three rooms, we felt like experts!) The closets and shelves were painted with a white paint.The hinges were taken off all the closets and spray painted silver. All light switch covers were taken off and spray painted cream. We did this in many of the projects we completed in the house. It was a lot more cost effective than buying new, especially when there was nothing wrong with them. Can you believe the transformation? I know I can't! The room was so dark, outdated and uninspiring. The ceiling had gold embossed ceiling tiles that were faded with time. With a fresh coat of white paint on the ceiling, trim and windowsills and a bright aqua blue color on the walls, it is a cheerful room that I can spend hours sewing my heart out! I moved in my sewing table, which my dad built for me a number of years ago, perfect for holding my sewing machine and serger. Plus it has a number of drawers to hold all the sewing notions I need to complete my projects. As you look through the photos, you will see my sewing themed curtains. I used an Alexander Henry print with sewing notions prints - rotary cutters, sewing machines, buttons, measuring tape and more! I saved my grandmother's retro kitchen table to be used as my work/cutting table. (I like to include at least one vintage touch in each of the rooms of our house, even if the room tends to have more modern decor.) I put the table up on bed risers to raise the table just enough that I don't get backache when I'm working! So here is part of my fabric stash--- I don't know whether I should be proud of this... I've seen MUCH worse, but I sometimes can't believe how it piles up! Will I ever get to sew all of this? Probably not. I know there are some items I absolutely fell in love with at some point and now I have no interest in making anything with it. What do I do with it? I sell it on eBay or give it to fellow sewers. Because I have access to so many different fabrics I feel like my stash is pretty special. I organize my stash by swatching it on an index card and keep them filed by fabric type. You can read about the fabric organization idea in "Organizing Your Stash." I also keep fabric in the plastic drawers underneath the cutting table. (You can see those in some of the other pictures.) I also have my collection of quilting cottons in a separate area. At one point I was doing more quilting than garment sewing. I haven't made too many quilts in the past few years, but cannot resist a cute print. My quilting cottons are not swatched on an index card like my garment fabrics are, but they are organized by color. When I lived at home a had a lot of knick-knacks I collected over the years. The scalloped shelf cubby is perfect for all of the sentimental things that I wasn't sure where to display in other parts of our house. My husband hung a floating shelf for some sewing related items to be on display. Below the floating shelf, I have a "curtain wire" installed on the wall where I hang pattern pieces and directions to my current sewing projects. I got the "curtain wire" at Ikea. This is one of the best things I added to my sewing room! Believe me, my sewing room does not stay this neat on a regular basis, but it felt great to get it in order for the photos! Stay tuned, I'm going to share with you some sewing room organizing ideas in my next post. Do you want to share your sewing room with us? We'd love to share it for you! Email fabricmartblog@gmail.com for more information. Helloooo!! I'm back and I'm still sewing with knits! Recently I made it my mission to find more TNT- tried and true patterns, those that I've mastered the fit on and I can come back to again and again for easy no fuss makes. One of the patterns I chose to master was a basic knit dress. What's not to love about knits I ask?? I'm quickly becoming obsessed! Knits are so comfy to wear...soft, breathable, stretchy and easy to launder, wash-dry-no iron involved! 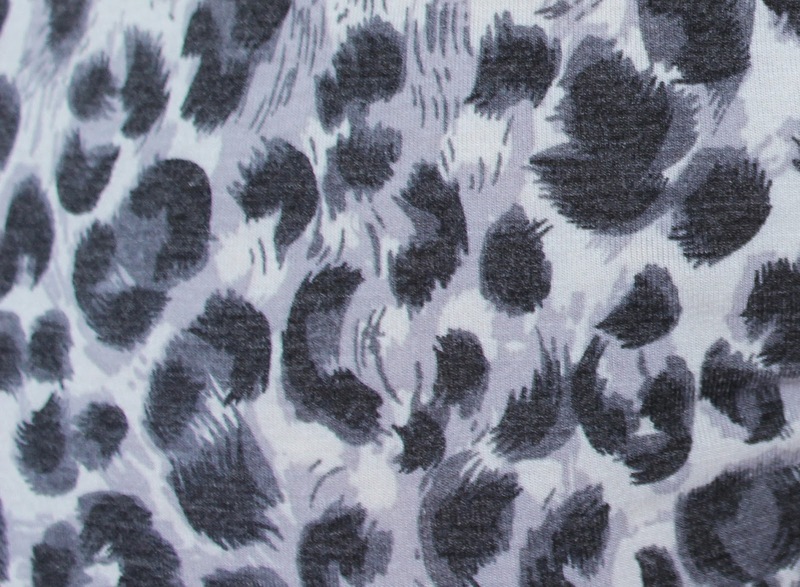 I picked up this fun animal print jersey knit from Fabric Mart. (Exact fabric not available yet, but check out the other knits available!) It's lightweight and super comfy. For the pattern I used Kitschy Coo's Lady Skater pattern. This pattern is very functional, dress it up for work or play it down with some sneakers for shopping. It features a fitted bodice that ends at the natural waistline and flows into an easy breezy skirt. It's flattering on any body type. 4. Shortened the sleeves 5 inches. Once my muslin confirmed a good fit I moved on to the real deal. Using my serger allowed me to make this in a little over an hour. I always breathe a little easier after the neckline band is attached. I'm so paranoid I'm either going to stretch it too much resulting in a puckered neckline or stretch it not enough for a floppy neckline. This neck band was drafted to perfection, no holding my breath necessary! The only time I used my sewing machine was when using the twin needle to finish the neckline and hem line. I'm really pleased and excited to have one tried and true pattern to add to my stash. 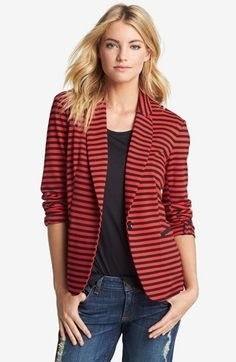 I've also made this up in a red ponte knit and think this striped print would be super cute. Because the knit is lighter weight it will be perfect for spring or summer. But that's not gonna stop me from wearing it now with boots and a cardigan! What's your TNT knit pattern? If you live on the east coast or know someone who does, you may hear a lot of complaining about something that starts with the letter "S"...SNOW! It is nice to look at for a little while but when you have to go places, it is not as fun! We have been bombarded with snow lately and more is on the way! The only nice thing is when it snows, I can lock myself up in my sewing room! I'm honestly not all that interested in making winter items at the moment, but have three projects in mind to make for early spring. 1) A basic blazer made from black ponte knit. All images courtesy of Pinterest. 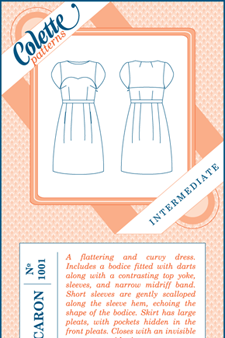 I am using Simplicity pattern #4698 (out-of-print) that I've had for a number of years. I already pre-washed the good fabric, made a muslin and cut the pattern from the good fabric. I'm hoping to make the jacket this weekend. 2) The Macaron Dress by Colette Patterns, made from a floral print cotton pique and lace. This fabric was originally in Julie's Picks a few months back. I snatched up a piece for myself before it sold out. 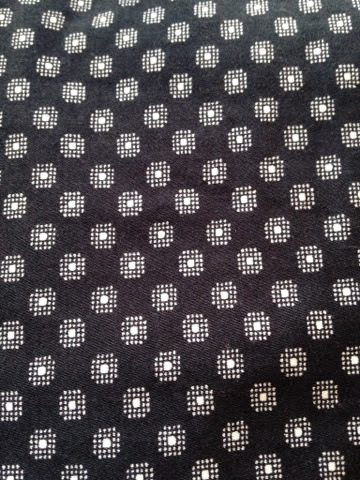 Then on a recent fabric buying trip I found another roll of it. I have known what I would like to make from it since the day I brought it home. I also knew that I would blog about the finished product in the near future, so I decided I should buy the other roll. This fabric will be available online soon! I will be pairing this print with a lace from my stash. I have a few laces to choose from, but am unsure which one I will use in the end. Photo from Pinterest, a Lilly Pulitzer design. Photo from Pinterest, an Anna Sui design. 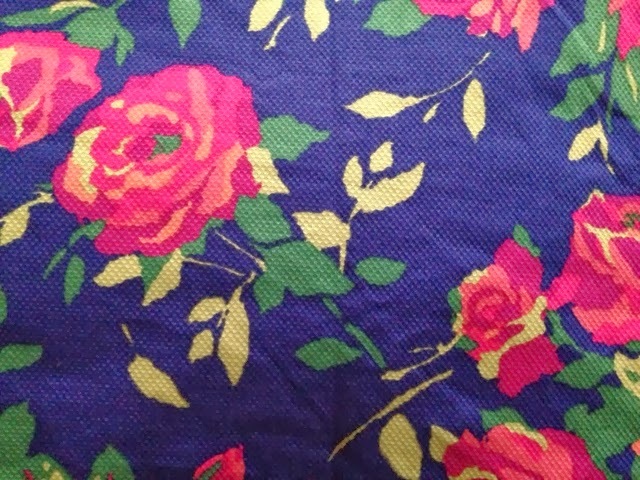 The bright colors and floral print of the fabric and the retro feel of the pattern reminded me of Lilly Pulitzer designs. So this will be my "Lilly Pulitzer-inspired dress." 3) Printed cotton sateen slim leg trousers. Another project inspired by Lilly Pulitzer. 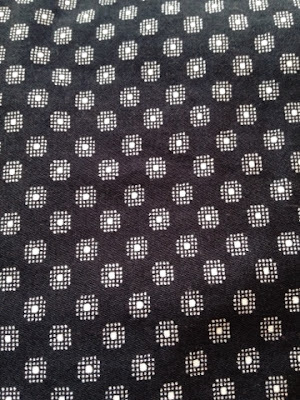 This fabric is sophisticated, but still fun when used in trousers. Printed pants have become popular again and I embraced this trend with a few pairs of printed shorts last summer. I never blogged about them, but it was a fun way to jazz up my summer wardrobe. So I'm going to give it a try in a pant. It has been a long time since I made pants for myself. I find them intimidating and would rather buy RTW because they are "good enough." I know there is a difference between a good fitting pant and a great fitting pant, but I have not gotten up the courage to do it. So I'm going to plunge into the pants world again and make some slim leg trousers. I haven't selected a pattern yet and thought I would get the viewers opinion on a good pants pattern. 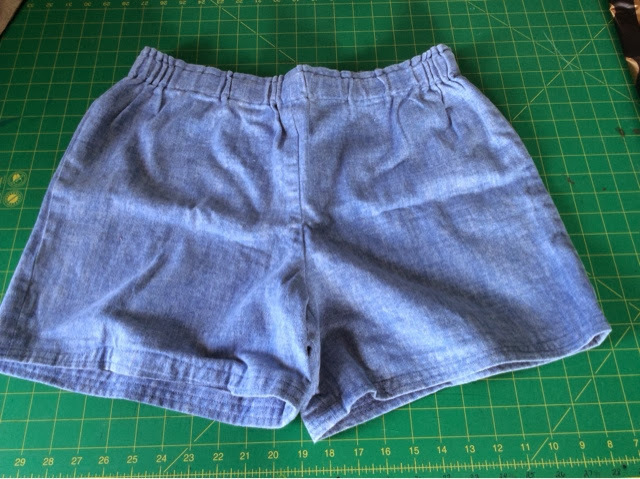 I'd love to be able to make more pants because I lack in that dept. So...what is your favorite pants pattern? I'm especially looking for a slim leg pattern, but if you have a TNT (tried and true) pants pattern that you would like to share, please do!